Ricky Pellow was full of praise for his Exeter Braves side as they edged ever closer to sealing their spot in this season’s Premiership Rugby Shield semi-finals. 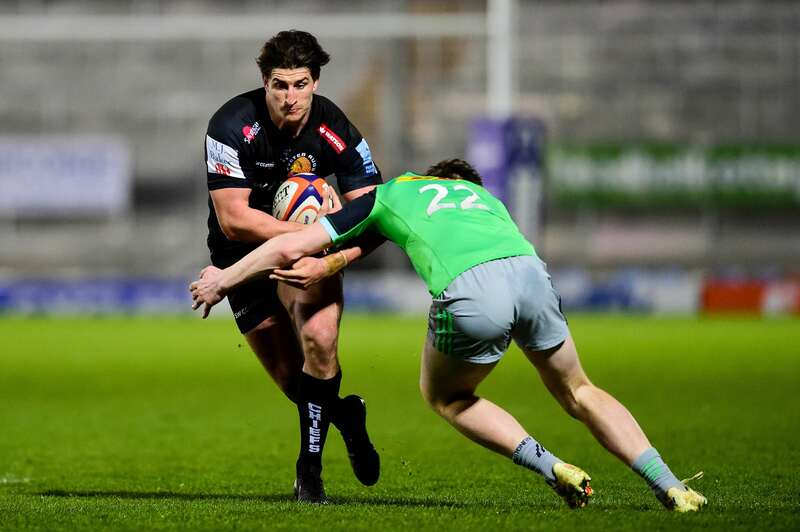 Monday night’s 47-12 victory over visiting Harlequins at Sandy Park, meant the Braves were able to extend their lead at the top of the Southern Conference over Saracens to seven points with just two games remaining in the regular season. The Londoners, however, still have a game in hand and have to tackle the Braves on Easter Monday (3pm) in a fixture which could decide who has home advantage in the last four. Before then, the Braves will travel to Bristol Bears this Sunday (1pm) looking to build on what was a dominant display on Monday, which yielded seven tries for Pellow’s side. “I thought it was a really measured performance from us,” said Pellow at the final whistle. “We talked before the game that we needed to play with an intensity and a physicality that they couldn’t live with, and for large parts of the game that is what we did and we got our rewards for it. “Some of our play at times was outstanding and it’s put us in a great position. We have talked openly that we have three games to book a home semi-final, so that’s our challenge and that’s our goal. After tonight, we’re one step closer. In a dominant display from start to finish, the Braves notched up their seventh win of the campaign courtesy of tries from James Freeman, Phil Dollman (2), Tom O’Flaherty, Harry Strong, James Short and Harvey Skinner, who also pocketed six conversions. Pellow hailed the all-round contribution of those on duty, but said he was particularly pleased with the way in which a number of the club’s younger players were stepping forward and leading from the front. “That’s probably the most experienced Braves side we’ve been able to put out all season,” added the Cornishman. “For us as coaches, there were lots of positives to take from the game. Guys like Max Bodilly and Tom Hendrickson, I thought were outstanding. No longer are they considered young guys within the team, they are senior players and we expect them to lead from the front and drive standards. “We all know about Max’s ability in attack, but it was his work in defence as well that really stood out. Hendo was the same, is like our rock in this competition. He’s one of our defensive leaders, but he backs up what he talks about out on the pitch. Pellow added: “What pleases us most as coaches is seeing these young guys really step up. If you look at our team tonight, quite a lot of them have had experience of playing for the first team in the Premiership and that is really helping them to develop.